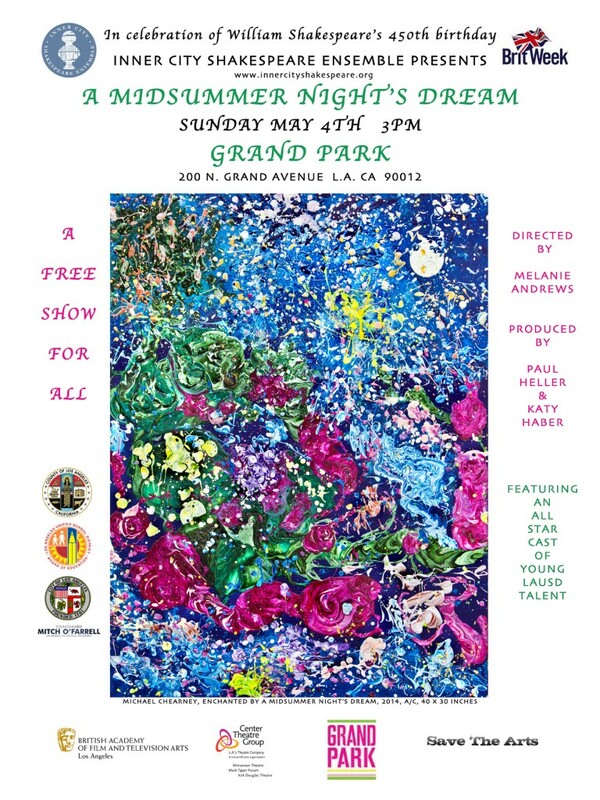 In partnership with Britweek, Bafta LA, The Music Center, LA County Parks and Recreation and the LAUSD Inner City Shakespeare will be presenting a production of A Midsummer Night’s Dream on May 4th 2014 at Grand Park in Los Angeles.The ICSE is proud to announce that it has cast a superb company of young students from numerous schools within the LAUSD school district.This production will provide an unique opportunity for talented youth to develop skills that will allow them to attend acting programs and a possible future in the industry. The ICSE will continue its collaboration with professional mentors to help the students with their understanding of Shakespeare as well as the actual the performance process, in addition to forming relationships that enhance academic motivation and personal development. Immediately following the May 4th Production, the ICSE repertory company will be performing A Midsummer Night’s Dream in other County parks throughout the spring.